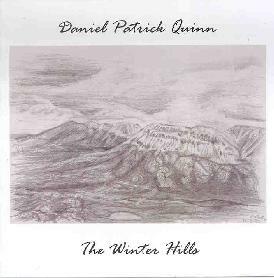 Daniel Patrick Quinn - "The Winter Hills"
The Winter Hills is the haunting debut CD from multi-talented 22-year old Lancanshire, UK native Daniel Patrick Quinn. Drawing on influences such as Brian Eno, Nico, and Jon Hassell, Quinn lays down a deep, swirling, droning soundscape of synthesizer, percussion, cello, bass, and trumpet, all of which he plays himself. This is a double CD, though I’m not sure why, as the first disc is only about 20-minutes and the second is around 30-minutes. Anyway, it makes for a nice full album length, and the two discs do have a difference. One the first, Quinn sings over his droning webs of sound, with a vocal style that falls somewhere between traditional folk and a male version of Nico. It comes off best when he sings in a slightly lower register, and adds vocal harmonies to the mix, like on Of Things to Come. The result is something that could be called ambient folk music. The second disc is mostly instrumental, and continues the pattern of spacey drones with slight folk and classical touches. Quinn utilizes the trumpet more on these tracks, bringing out his Jon Hassell influences, though he definitely brings a more wintry, European feel to his pieces, where Hassell would have tended more towards a warm, tropical world beat feel. The Winter Hills has a cool, spacious feel to it, conjuring up images of bleak, snow-covered landscapes with its innovative and richly evocative sounds. For more information you can visit the Suilven Recordings web site at: http://www.suilvenrecordings.com. Contact via snail mail c/o Suilven Recordings; PO Box 84; Carnforth; Lanc LA5 8WZ; England.